Headlies: Elias Found Sleeping In His Pod After Elimination Chamber - WrestleCrap - The Very Worst of Pro Wrestling! Las Vegas, NV – WWE Crew members were shocked to discover Elias, who had recently competed in the Elimination Chamber match, asleep inside one of the Chamber’s pods. Elias then picked up his guitar and bindle and made his way down the Las Vegas strip trying to hitch a ride to Monday Night Raw. He was last seen being maced by a group of women leaving Cirque du Soleil. 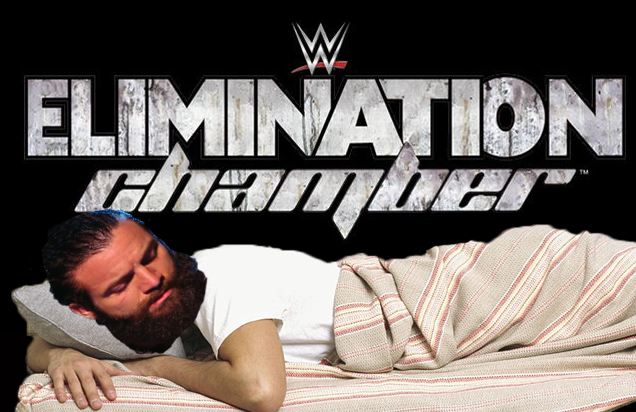 2 Responses to "Headlies: Elias Found Sleeping In His Pod After Elimination Chamber"
WHO WANTS TO NAP WITH ELIAS? !